Many years, fall is my favorite time in the garden here in Kansas. The tricky thing is getting yourself into a “fall” mindset when it is still blazingly hot in early August. 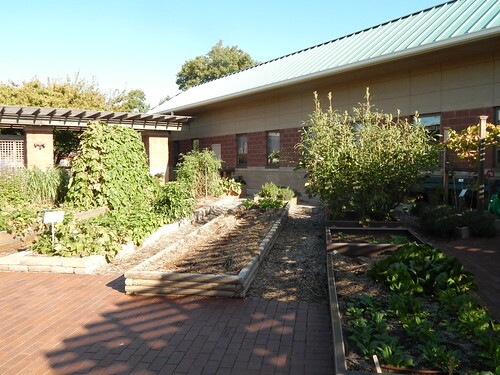 Yes, now is the time to plan, prepare, and plant your fall vegetable garden! We started seeds for some of our fall plantings about 4-5 weeks ago: broccoli, cauliflower, Japanese winter bunching onion, kale, and bok choy. I moved them outside onto the table near the building last week, so they don’t look quite this nice anymore. The flea beetles are going to do a number on our fall brassicas, I’m afraid. Despite the heat, I wanted to get at least some of these plants in the ground, because they are drying out too fast in the cell trays. Timing isn’t too critical on some of these, but the broccoli and cauliflower may not have a long enough growing season if we don’t plant them soon. We also have a number or root vegetables that need to be planted soon if we want to get a good crop. 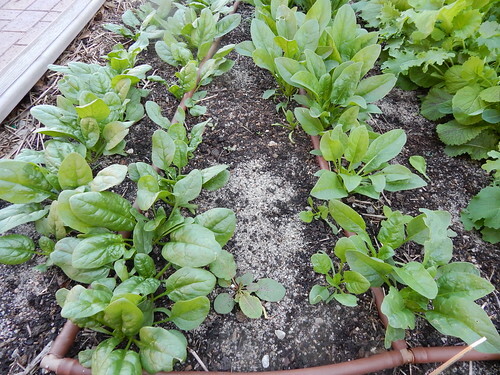 Things like lettuce and spinach need to wait a few more weeks, because the soil is just too warm to plant now. They also grow faster, so we can afford to wait a bit longer to plant. In preparation for planting some of our root vegetables next week, we put a thick layer of straw mulch down in some of the planting areas. 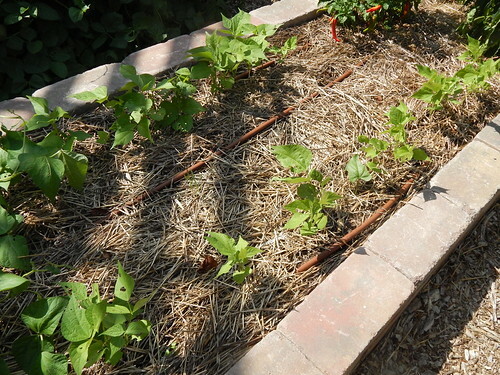 Organic mulches like straw can cool the soil up to 10 degrees in addition to helping with soil moisture. 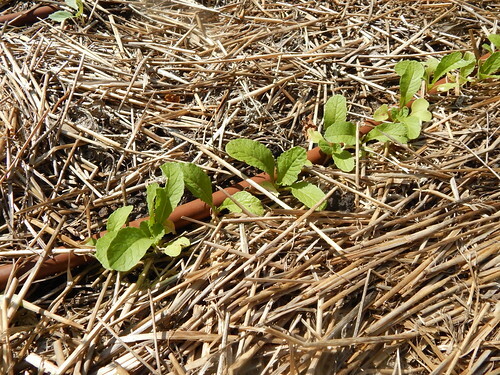 Hopefully we’ll get better germination because of the straw. I wonder if anyone has done a study looking at the relationship between the ugliness of a tomato plant and its productivity? Our tomato plants are UGLY, but the number of tomatoes we are still getting from them is a little bit ridiculous. We are slowly taking a few more plants out as they die. Our squash vines are starting to die back as well, but we won’t remove them for a couple more weeks. Past experiences tell us that trying to remove live vines from our cattle panel trellises is extremely difficult. Dead vines are much easier to deal with. Sometimes I’ve even had to cut the vines off at the ground and let them dry for a week before we can take everything down. 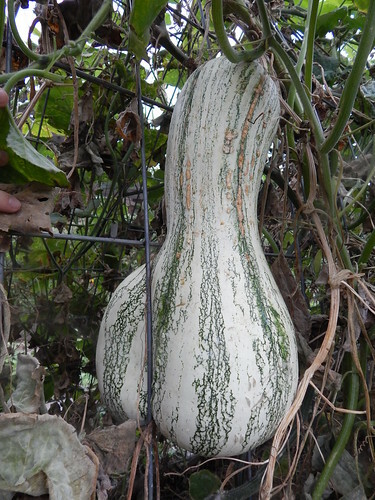 One of our projects this week was to extract this Green Striped Cushaw from where it had grown through the trellis. It took a big knife! We buried the knife! 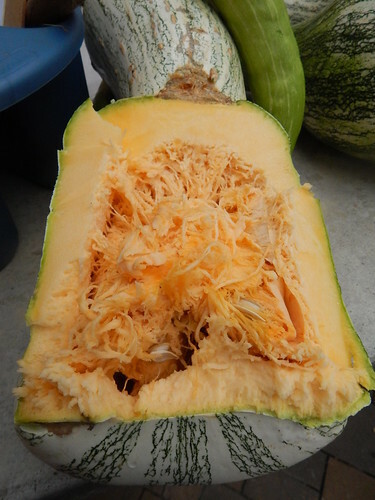 We cut the back part of the squash off, then had to trim it a bit more before pulling the other part off the trellis. That’s one way to get a square squash! 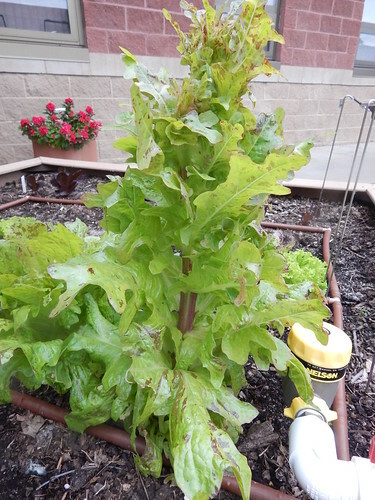 This lettuce plant went and bolted this week. I’m not really sure why. I suspect that the weather fluctuations probably played the biggest role in it. 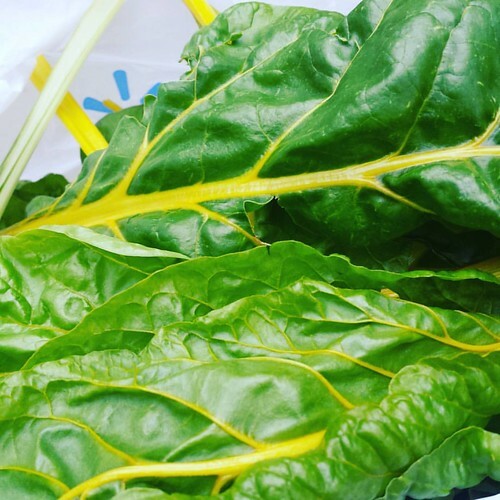 I know, I know…obligatory Swiss Chard photo for the week! I had to change it up with the yellow chard instead of the red. The garden continues its downhill trend for the fall. 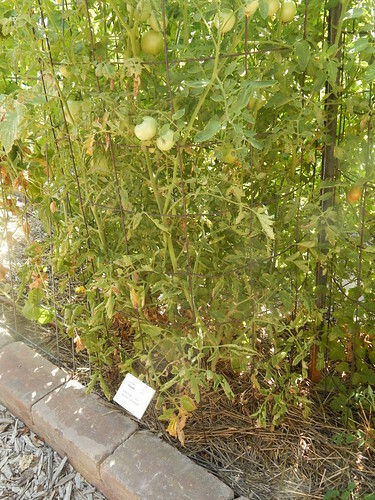 The tomatoes may still have some green fruit on them, but I’ll be honest that they have reached the stage of ugly where I just want to yank them out. We harvested quite a bit of squash this week and planted some late spinach seed for the fall. Our last Saturday Sampler of the year is tomorrow, and we’ve been busy in the kitchen chopping and prepping some of the squash from the garden. We estimated that we have at least 15-20 cups of cooked squash right now. Yikes! 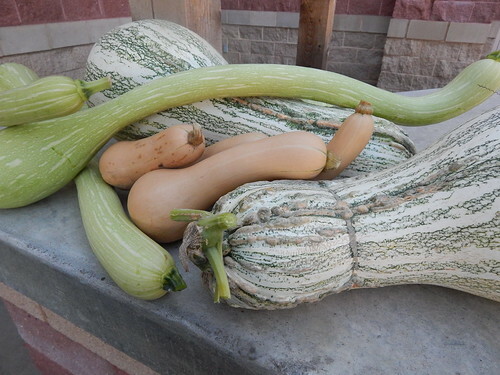 Come out to the Demo Garden at 9 a.m. on Saturday, Sept. 19th to learn more about growing and cooking winter squashes. This is just a portion of the Green Striped Cushaw. It is really tasty! 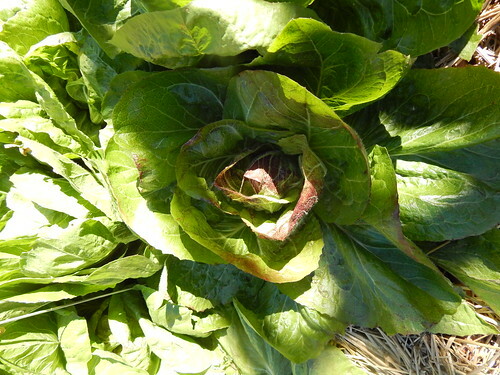 It is always a good start when the vegetable that is insect and disease resistant is also flavorful. The cushaw has a nice yellow flesh. 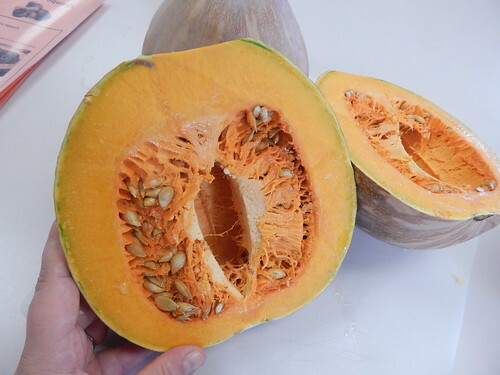 This is one of the ‘Fairy’ squash that has a much more orange colored flesh. We haven’t cooked it yet to compare flavors. SPOILER ALERT! We’re making this one into chili for Saturday. I guess we’re going backwards in time here. This is our “haul” from the garden this week. 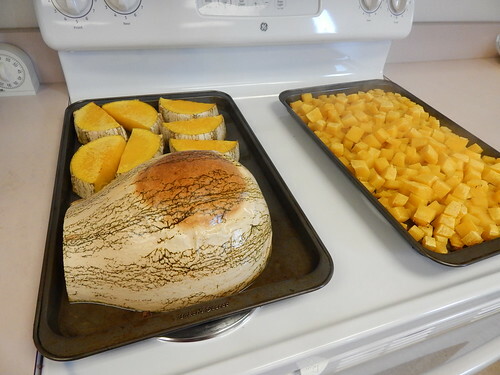 We harvested a bunch of butternut squashes, some tromboncino, and a couple more cushaws. 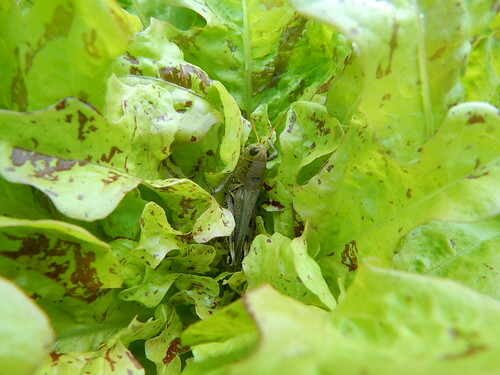 Some of the lettuce survived the caterpillar onslaught and some didn’t. This plant survived, only to have a grasshopper hanging out in the center on Monday morning. If it isn’t one thing, it’s another! 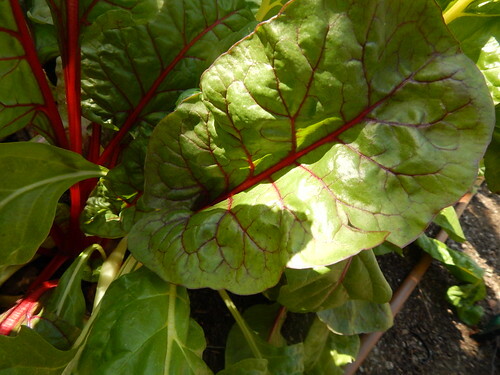 Sorry…I just had to break out a Swiss Chard photo to end the week. We’ve let it go for a couple weeks and it has gotten bigger quickly. It is one of the few things in the garden that is still looking spectacular! 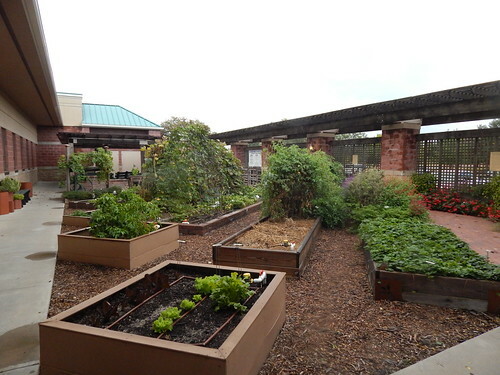 We haven’t done very many tours of individual garden beds this year, for some reason. 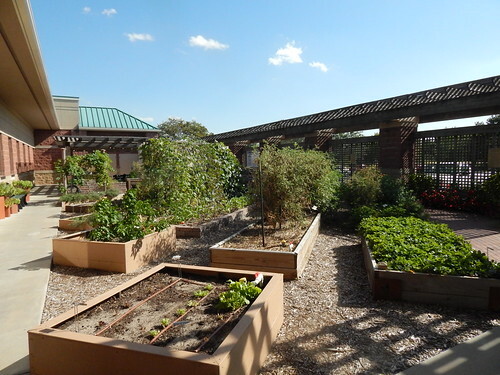 I thought today seemed like a good day to take a look at the MG Faves Garden. On the end of the garden, where the Yukon Gold potatoes resided earlier this year, we have a planting of ‘Rocdor’ yellow beans. They are generally looking pretty healthy and will probably start blooming in a couple weeks. Yum, fall beans! 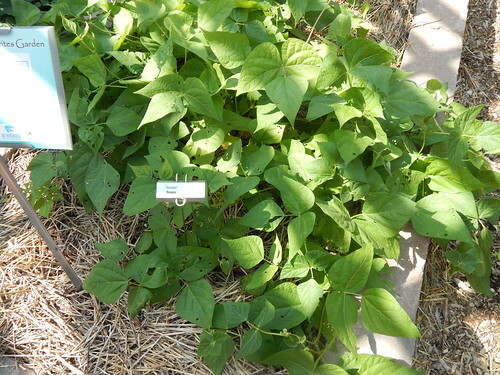 Next to the ‘Rocdor’ beans is our fall planting of ‘Beananza’ beans. These were planted a couple weeks later, so they aren’t quite as far along. We had originally planned to try to keep the spring planting all year, but the spider mites just got too bad. So with that situation, we moved the ‘Beananza’ beans to this spot, where we would have other wise planted more root vegetables. Since this is the spot we just pulled beets and carrots out of, it wouldn’t have been ideal to go back in with more root veggies anyway. 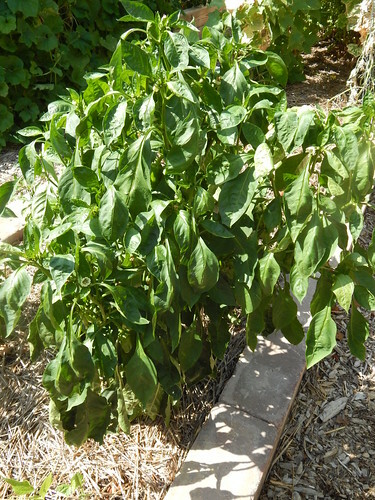 The ‘Big Bertha’ bell pepper plants are huge, but they haven’t been very productive recently. They had a few peppers early in the summer, and all the remaining peppers are still pretty small. This isn’t uncommon with peppers, but my perception is that these plants are less productive than in other years we have grown this variety. On the other side of the bed, we have two Cayenne pepper plants. They have been quite productive this summer. 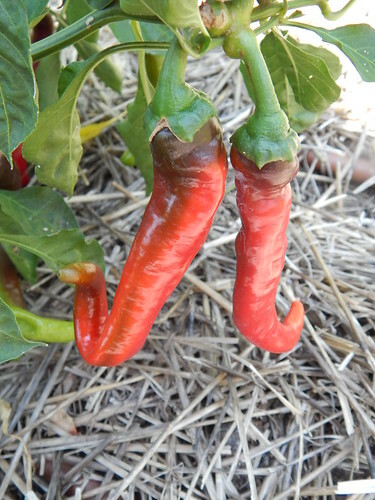 But then…it seems like hot peppers are always more productive than you wish they were! Then we have the fall vegetable section, with a row of kohrabi (not pictured), and a row of healthy Watermelon Radishes. There will also be a row of lettuce or spinach planted in a couple weeks. I didn’t take any pictures of the cucumbers on the trellis, because there isn’t much to see. I’m not sure why, but neither the ‘Sweet Burpless’ nor the ‘Straight Eight’ have been particularly productive. It may be the shading from other plants or something, but the plants aren’t huge and while we’ve gotten several cucumbers at a time, they aren’t spectacular. They do have a fair bit of anthracnose from earlier in the summer when it was rainy and cool, but I would have expected them to grow out of it by now. We will probably pull them out and remove the trellis in a couple weeks to plant some fall salad greens. The Jet Star has been reasonably productive, but again, not as productive as I think it should have been. In thinking about it and looking at the picture, I suspect that we should have used some fertilizer in the mid-summer after the first flush of fruit set. 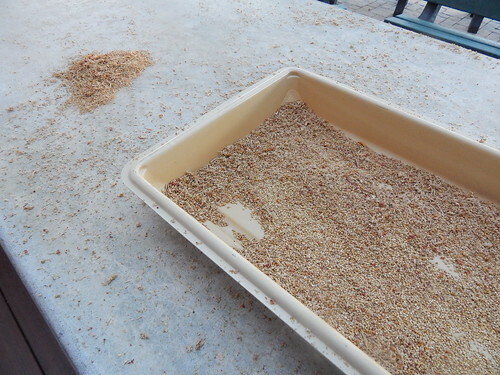 We put so much compost in during the spring, that I didn’t really think about it. However, the garden soil is pretty sandy and with all the rain and irrigation, these plants could be nitrogen starved. They do look a little bit yellow and peaked. At this point, I think that there’s not a lot of point in fertilizing, because I don’t know that it would get us anything. We’ll think about it! The poor Cardinal basil! 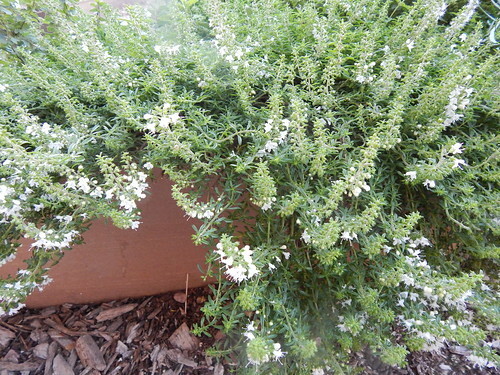 When we grew it 2 years ago, the plant was huge and gorgeous and full of blooms. This year I don’t think it has even considered blooming. I think this is a case of way too much shade from the nearby tomatoes and trellises. 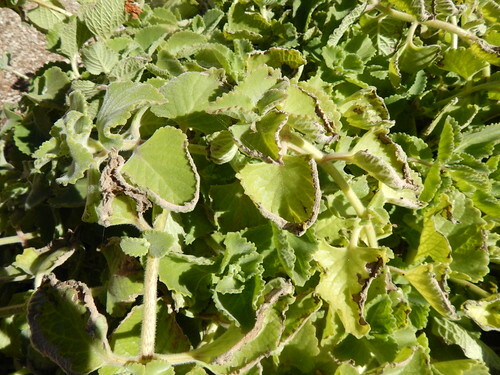 The plant looks generally healthy, just small. We have had more problems with shading this year than the last two years, it seems. 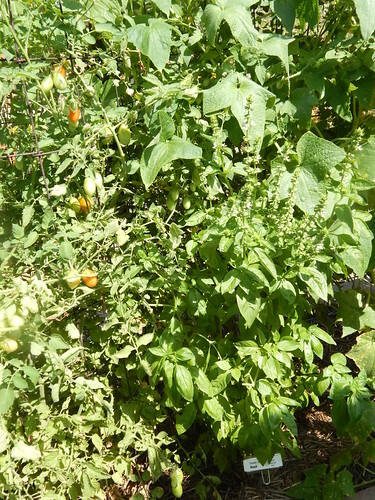 The sweet basil is sandwiched in between the Juliet tomato and the cucumber trellis. Can you see it there, stretching out? 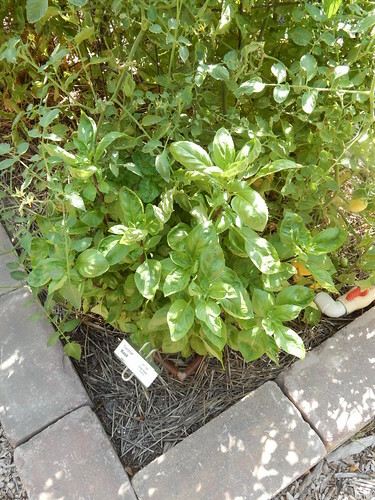 This basil also got shaded, but has just enough sun to encourage it to stretch. The ‘Juliet’ tomatoes have been fairly productive, as they do tend to be, although not quite as much as I would expect. That’s what’s up in the MG Faves Garden! Is your garden starting to look tired too?